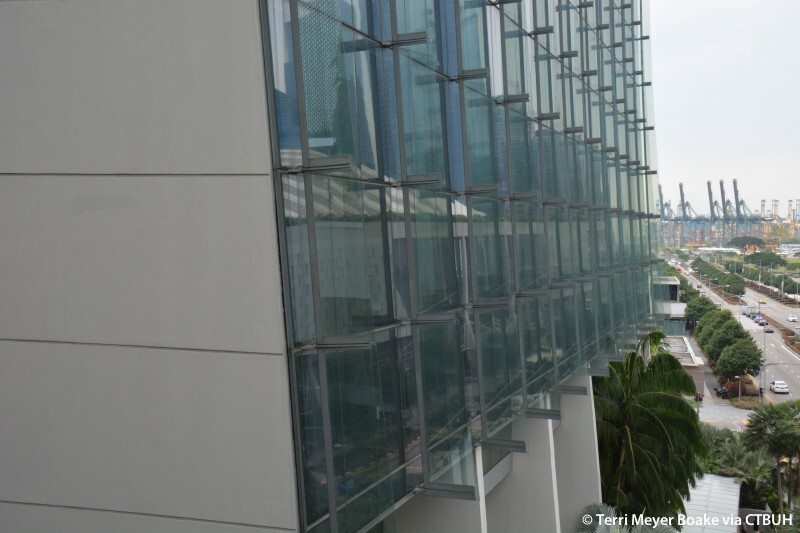 Developer	 Marina Bay Sands Pte Ltd.
• Cladding	 HALFEN;	JORDAHL;	Jangho Group Co., Ltd.
Marina Bay Sands is a high-density, mixed-use integrated resort that brings together a 2,560-room hotel, a SkyPark, convention center, shopping and dining, theaters, museum, and a casino across the water from Singapore’s central business district. 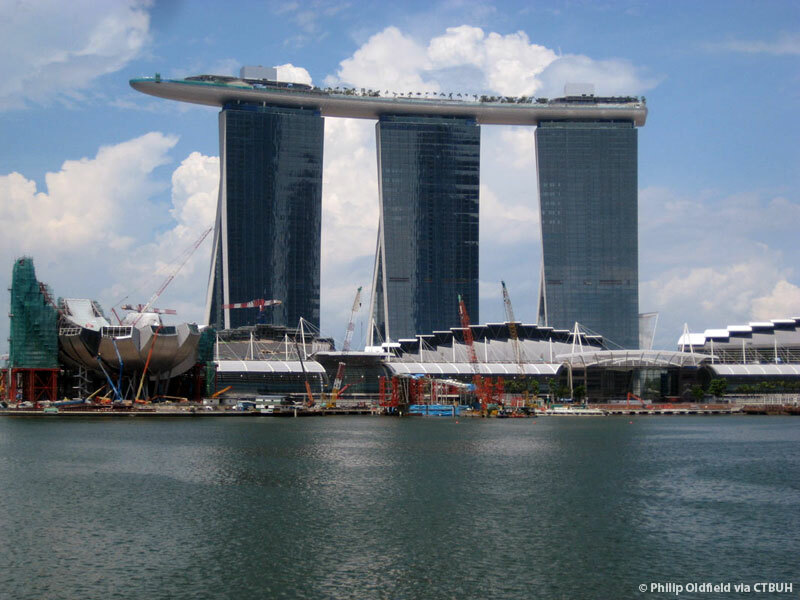 The 929,000 sq m (10,000,000 sq ft) urban district anchors the Singapore waterfront, and creates a gateway to Singapore. 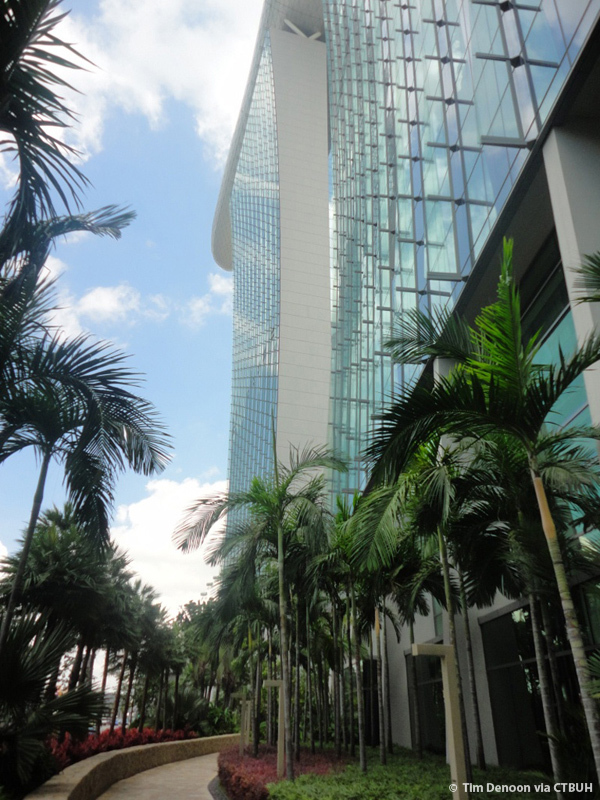 The design approach for the complex was not as a building project, but as a microcosm of a city—rooted in Singapore’s culture, climate and contemporary life. 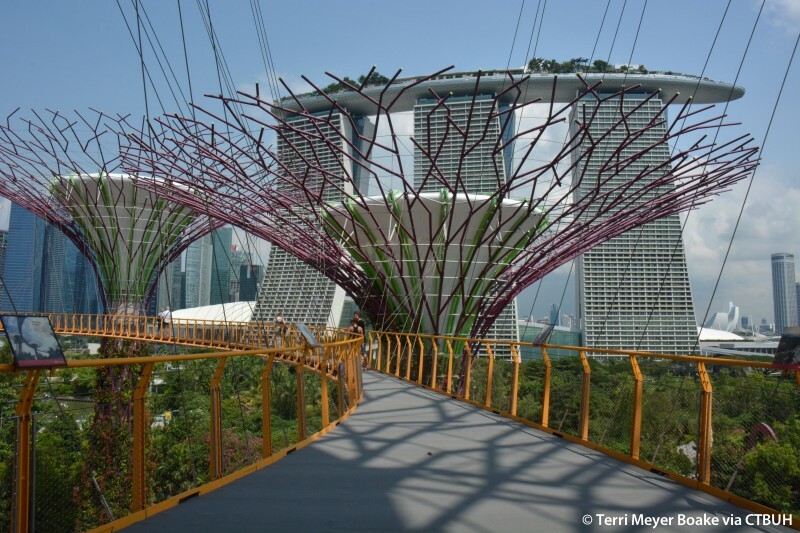 The aim was to create an urban landscape capable of addressing the issue of megascale. 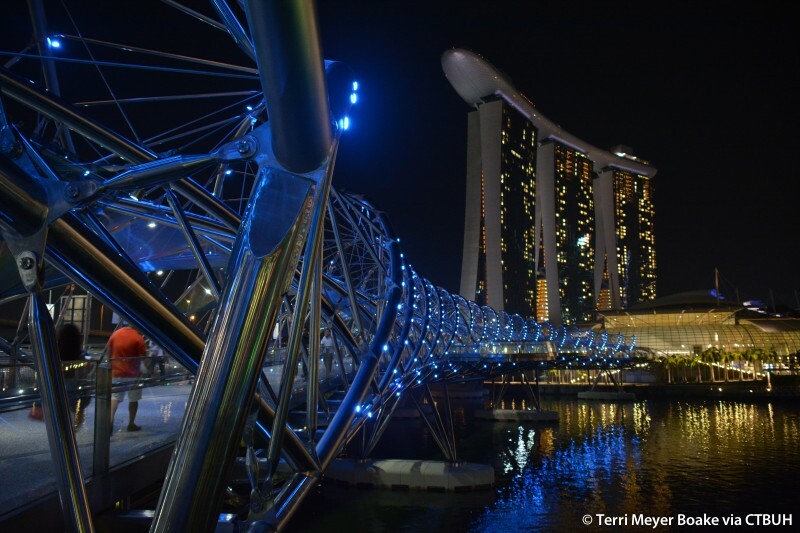 The project is designed as an urban structure that weaves together the components of a complex program into a dynamic urban crossroads and public meeting place. 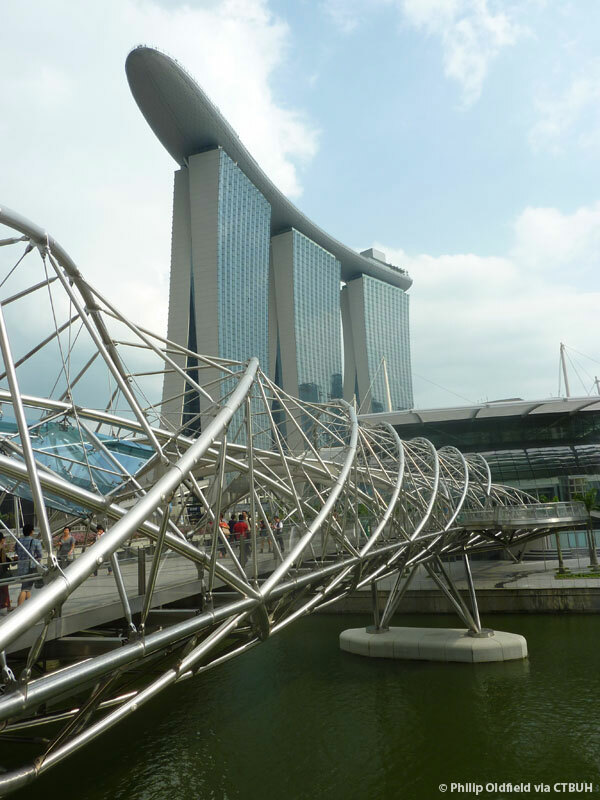 Inspired by great ancient cities that were ordered around a vital public thoroughfare, Marina Bay Sands is organized around two principal axes that traverse the district and give it a sense of orientation placing emphasis on the pedestrian street as the focus of civic life. 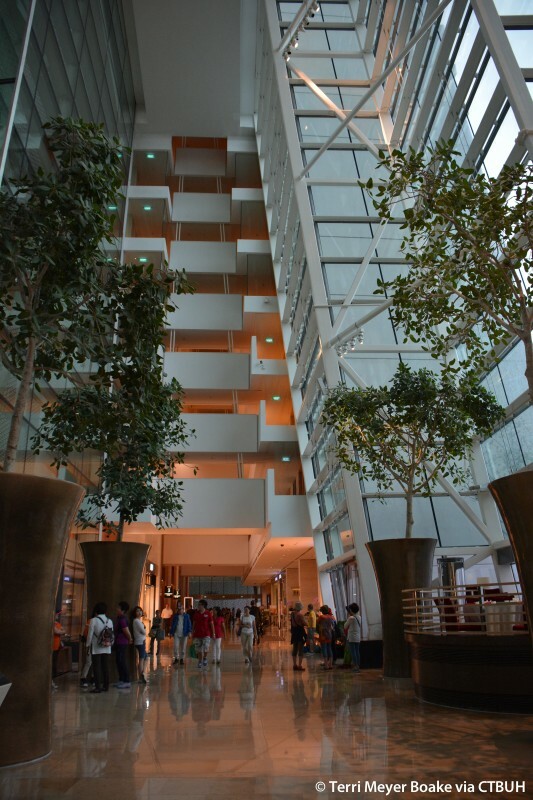 Combining indoor and outdoor spaces and providing a platform for a wide array of activities, this vibrant, 21st-century cardo maximus, or grand arcade, also connects to the subway and other transportation. 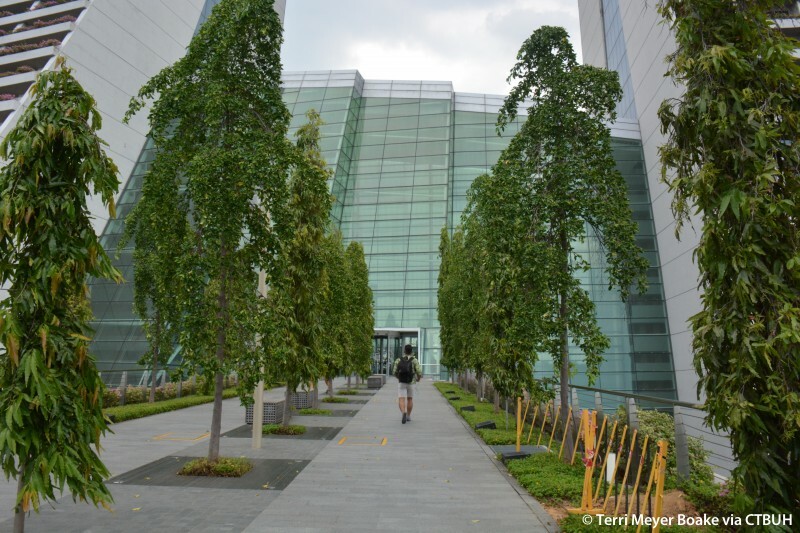 A series of layered gardens provide ample green space throughout the site, extending the tropical garden landscape from Marina City Park towards the Bayfront. 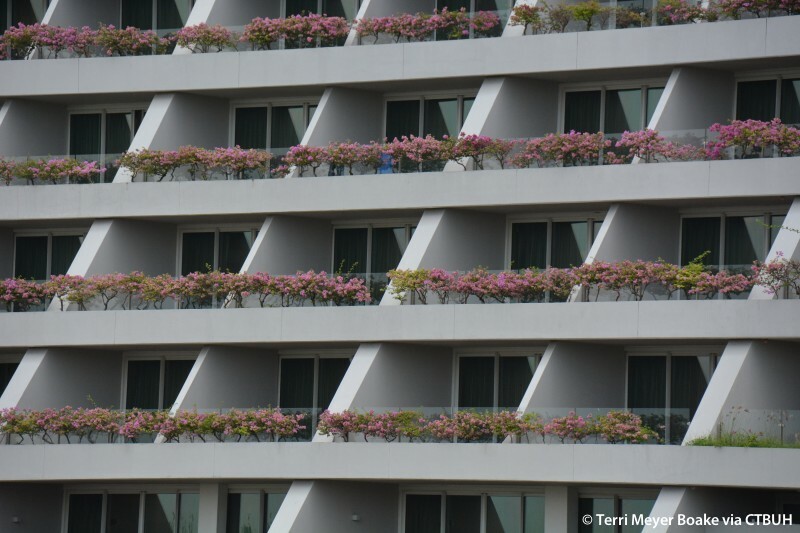 The landscape network reinforces urban connections with the resort’s surroundings and every level of the district has green space that is accessible to the public. 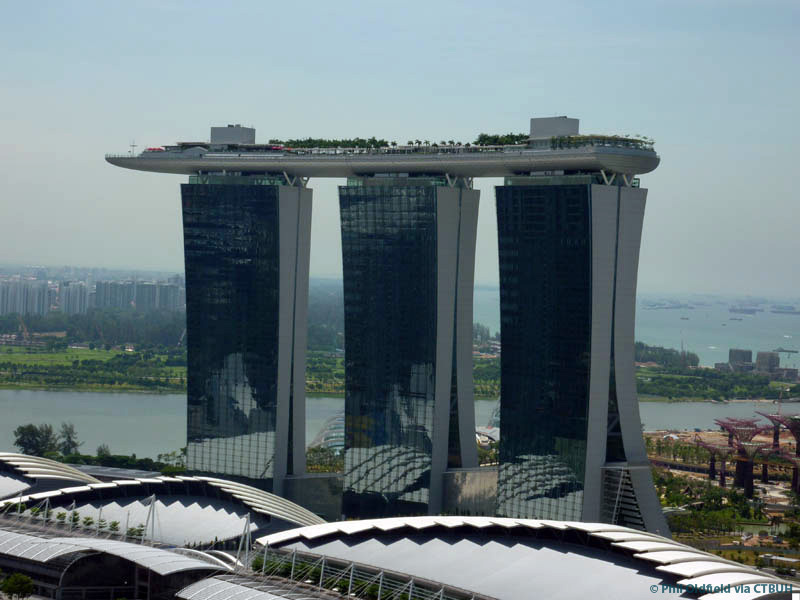 The most innovative aspect of Marina Bay Sands, both conceptually and technically, is the 1 hectare (2.5 acre) SkyPark atop the hotel towers. 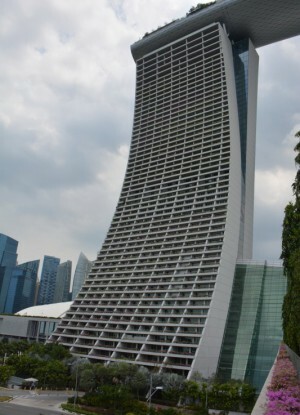 Locating the park and hotel amenities at 200m (656ft) above the sea afforded the architect the ability to keep the majority of the project relatively low in height. 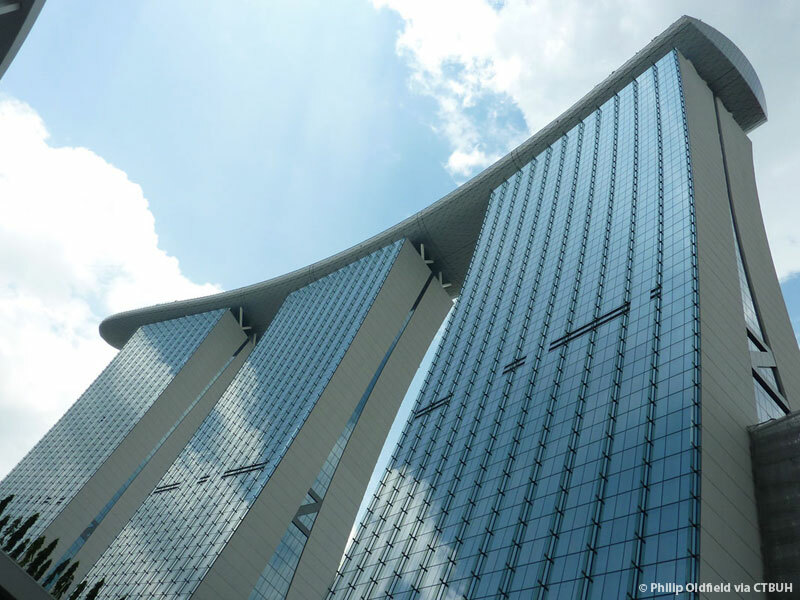 The three towers anchor the district and are connected at the top by the SkyPark—an engineering marvel that is longer than the Eiffel Tower is tall and large enough to park four-and-a-half A380 jumbo jets. 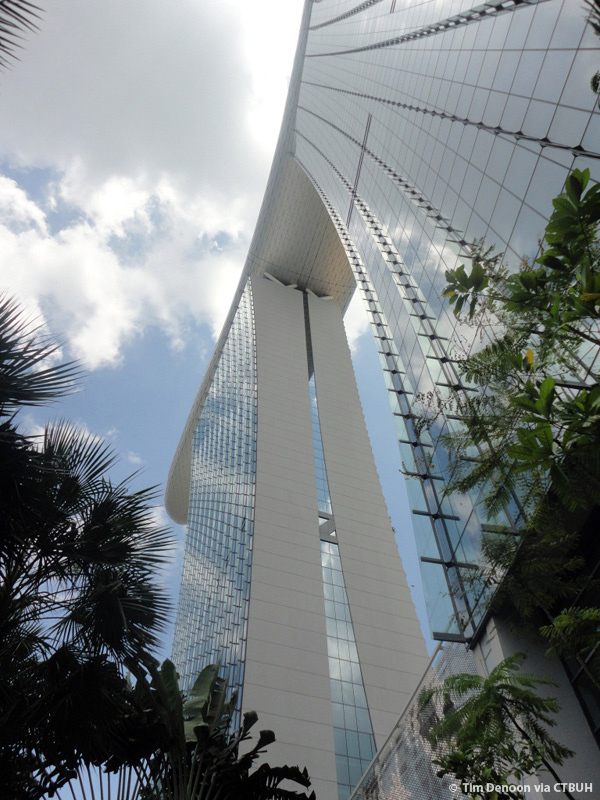 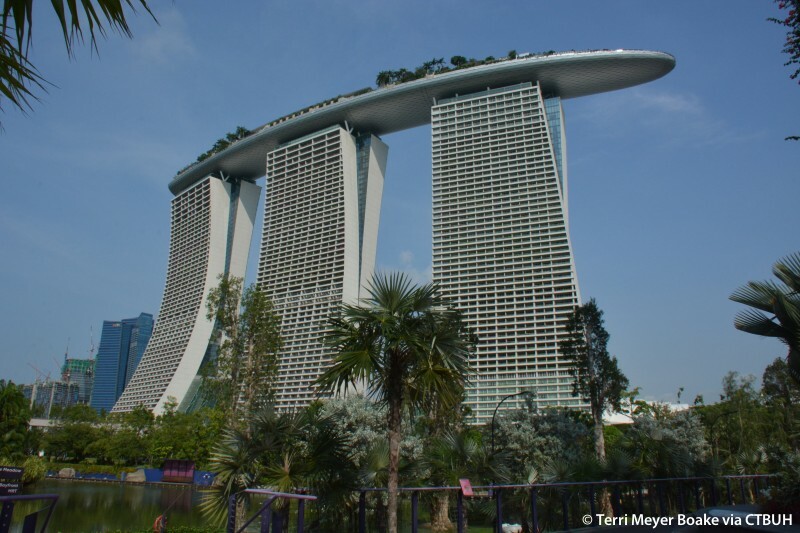 The 65m (213ft) cantilever of the SkyPark past the third hotel tower forms one of the world’s largest public cantilevers. 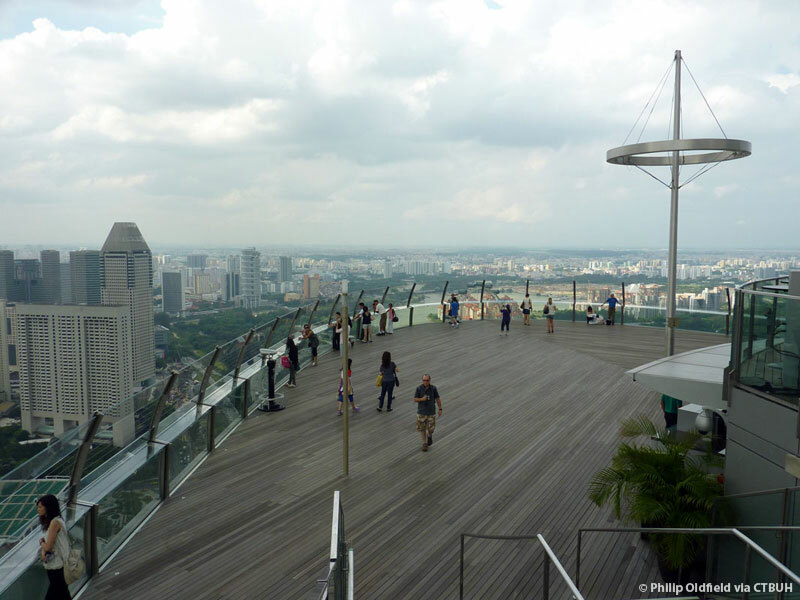 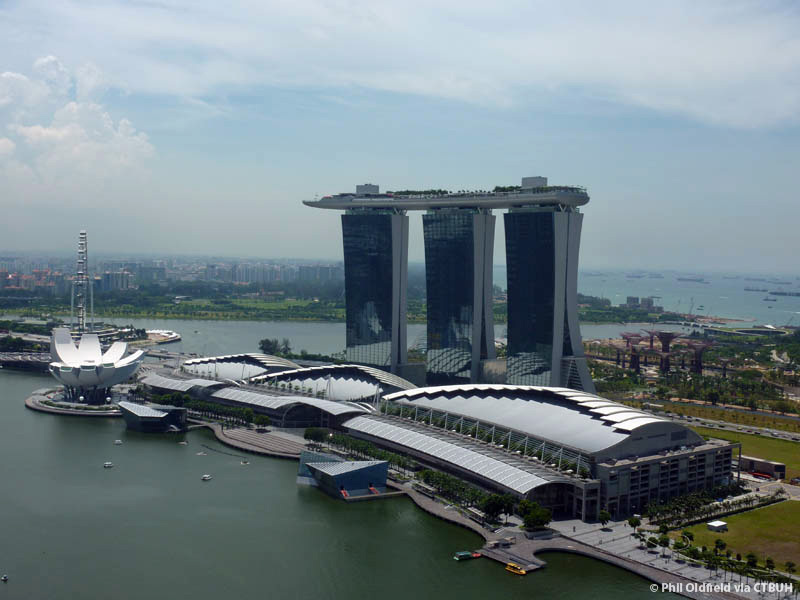 The SkyPark accommodates a public observatory, gardens, a 151 meter-long (495 foot-long) swimming pool, restaurants, and jogging paths and offers sweeping panoramic views, a formidable resource in a dense city like Singapore. 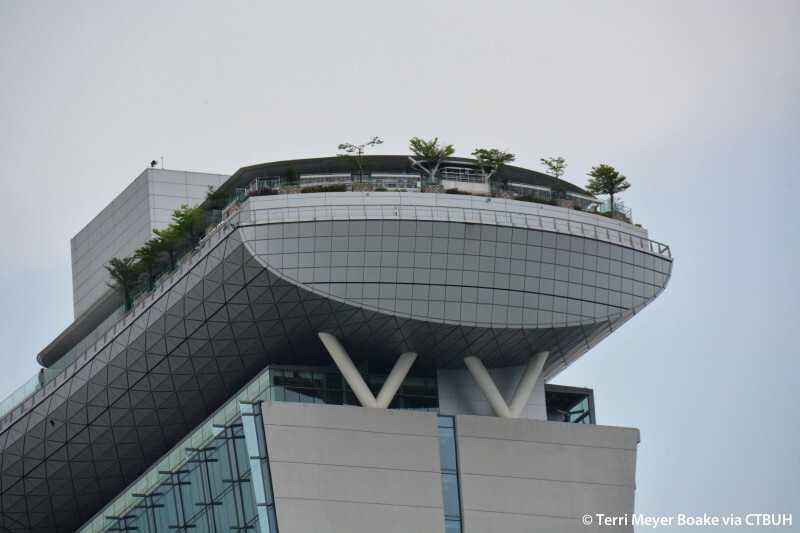 Shielded from the winds and lavishly planted with hundreds of trees, the SkyPark celebrates the notion of the Garden City that has been the underpinning of Singapore’s urban design strategy. 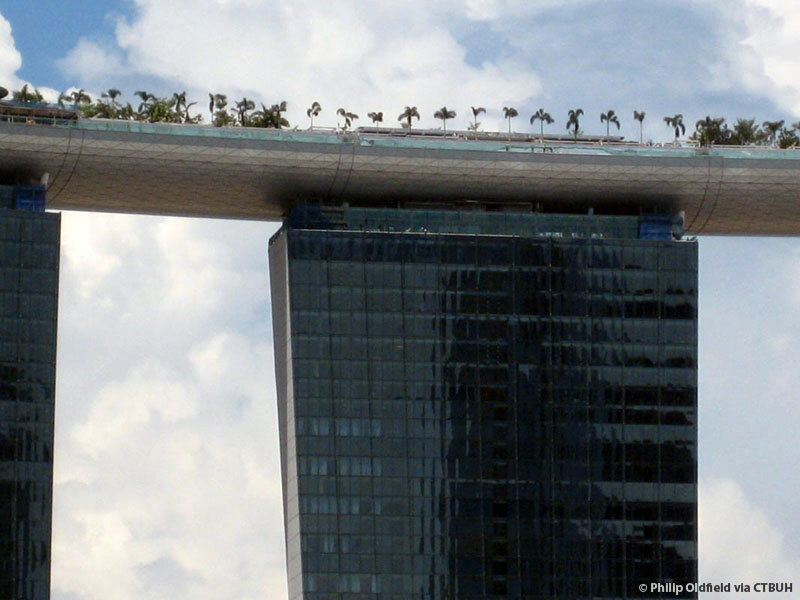 A post-tensioned box girder was designed to achieve this incredible cantilever. 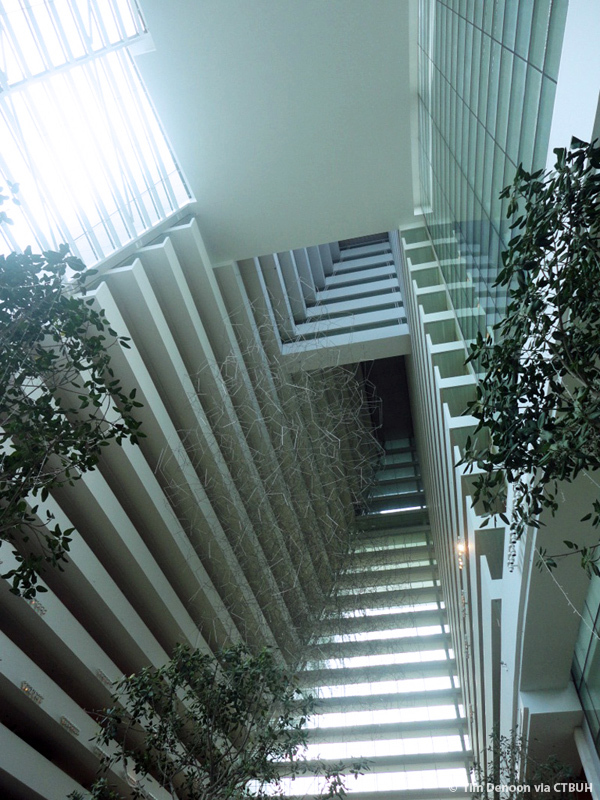 The maximum depth of the box girder is 10m (33ft) at the end support from the hotel tower and generally 3.5m (11ft) deep. 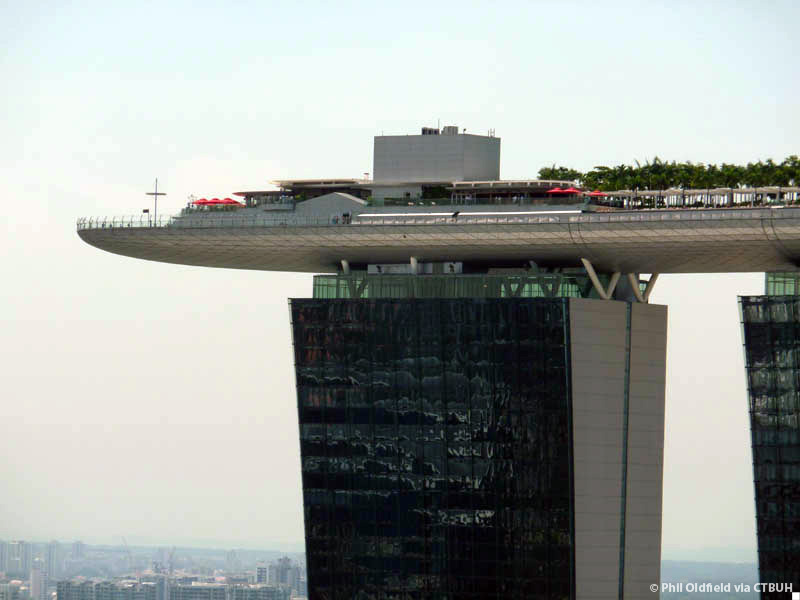 The lifting of the SkyPark was one of the many challenges that the project faced that required an innovative approach to the construction methods in order to facilitate one of the highest strand jacking operations ever undertaken. 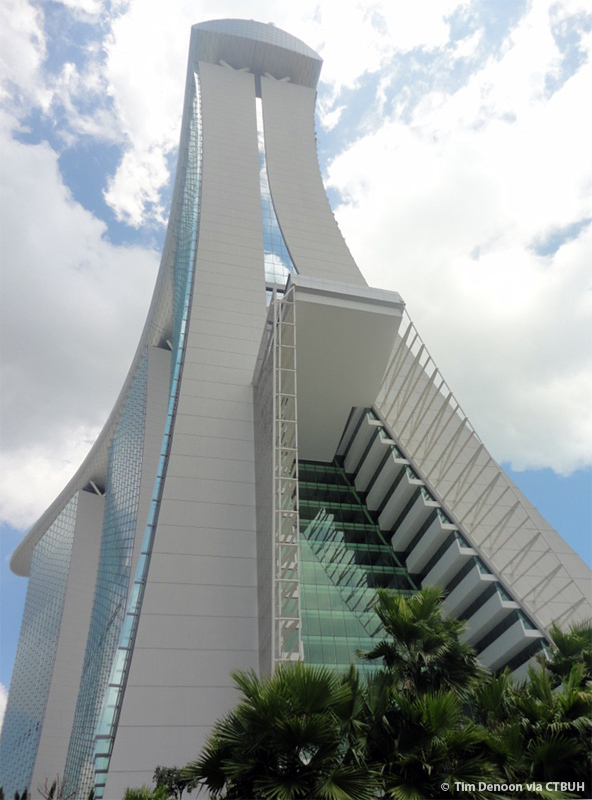 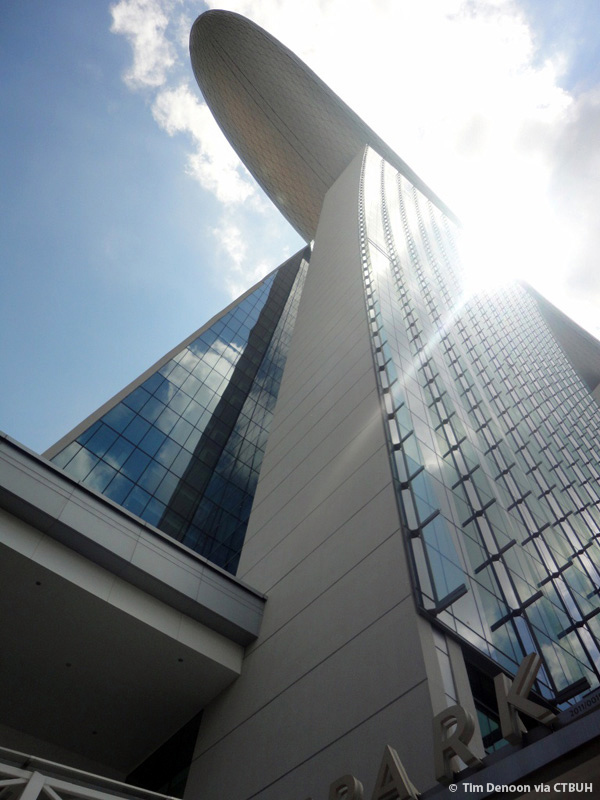 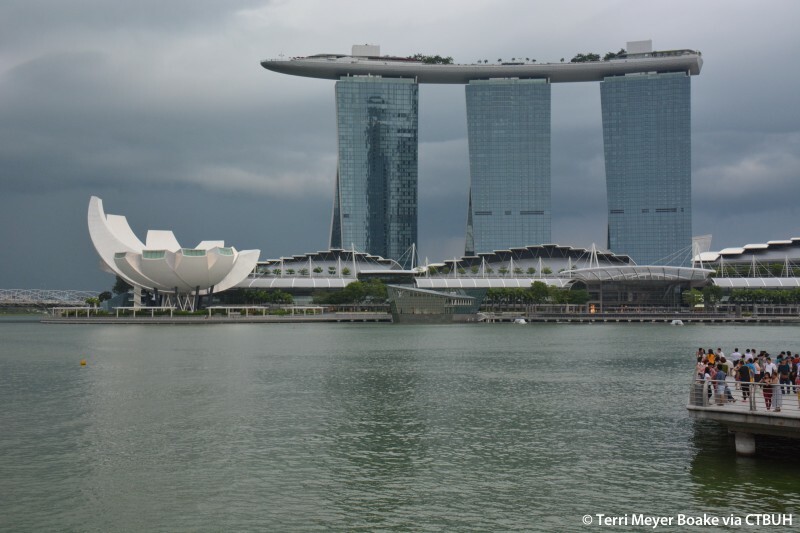 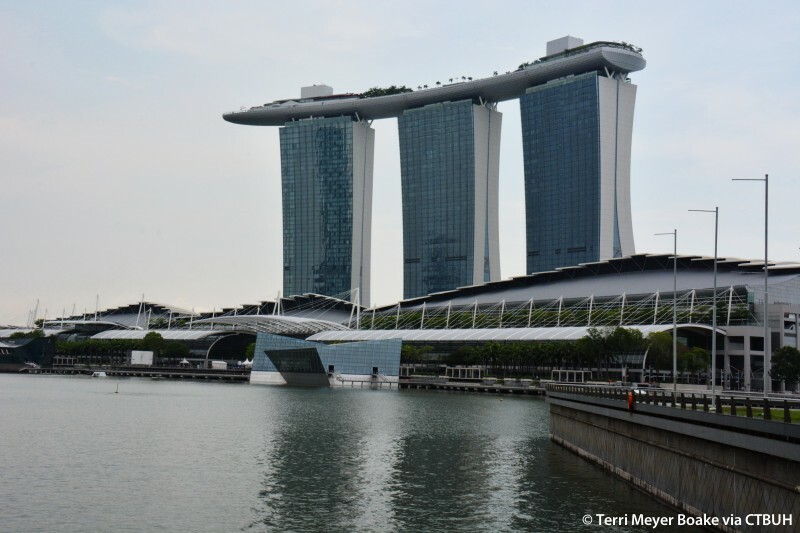 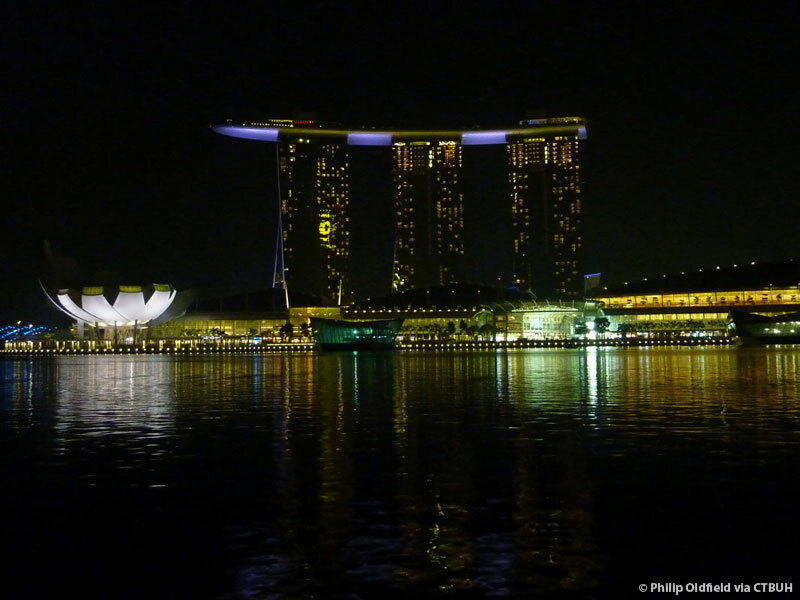 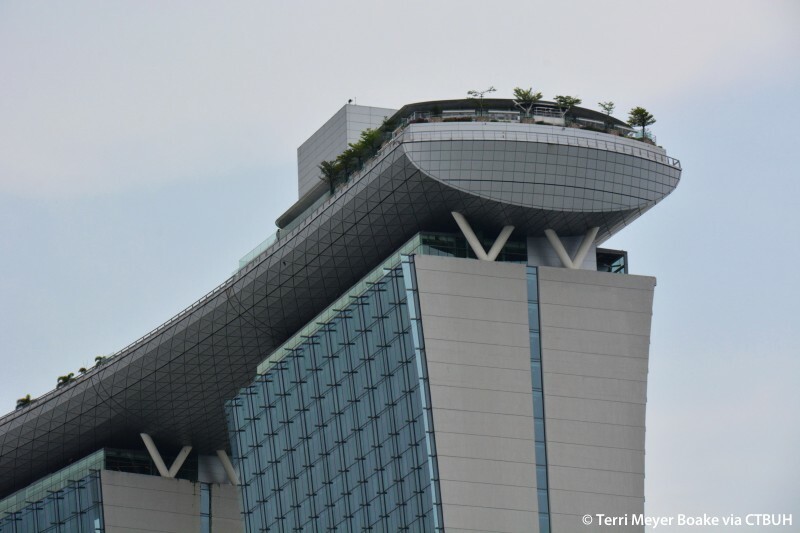 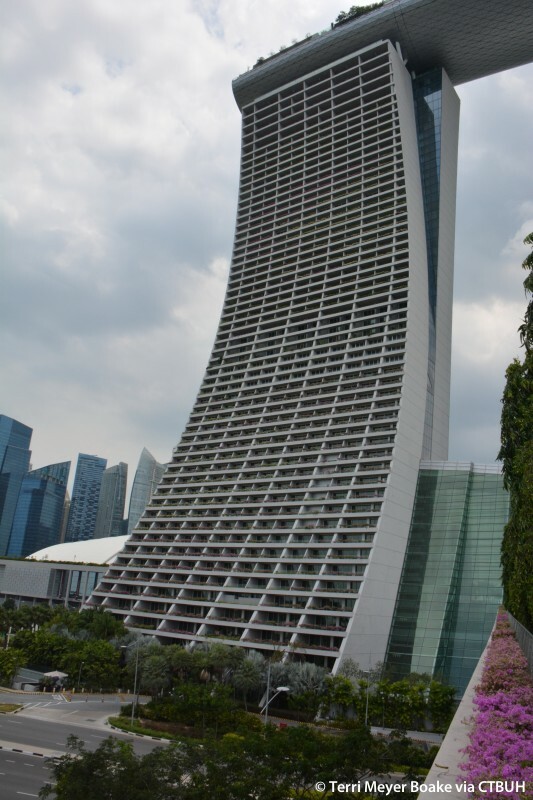 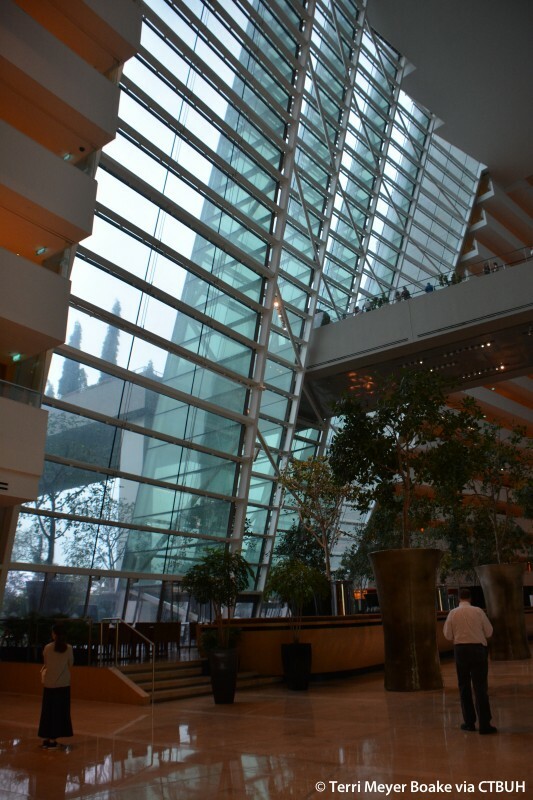 The hotel towers on which the SkyPark sits has an unusual and spectacular form that creates its distinct silhouette. 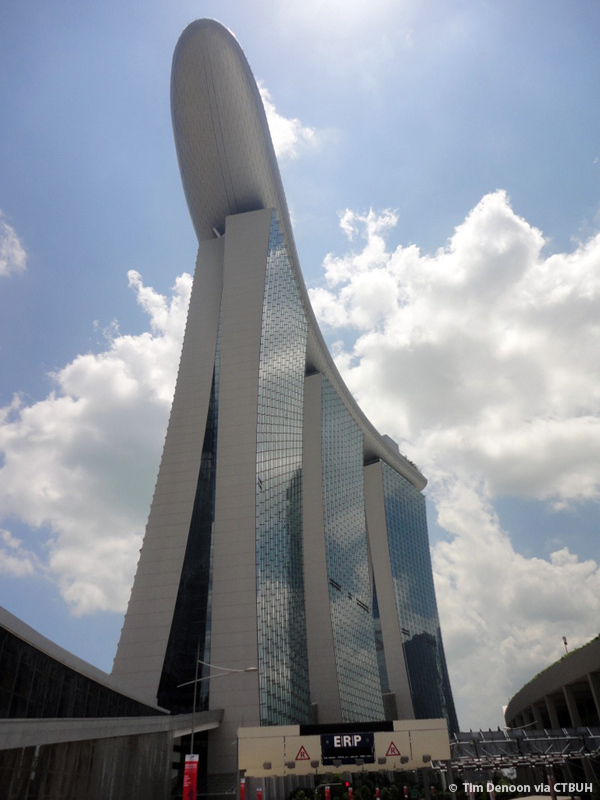 Each tower is formed by two curved and splayed legs that lean into one another as they rise, ultimately becoming one at the upper levels. 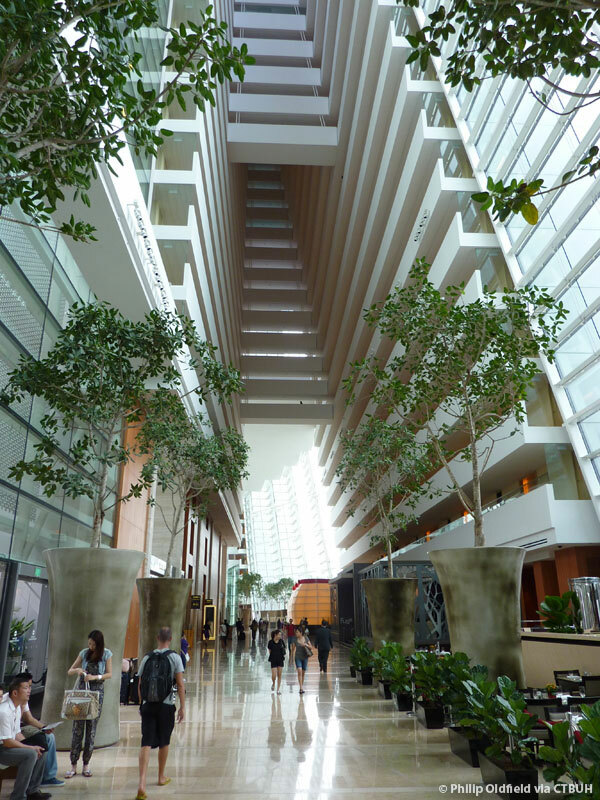 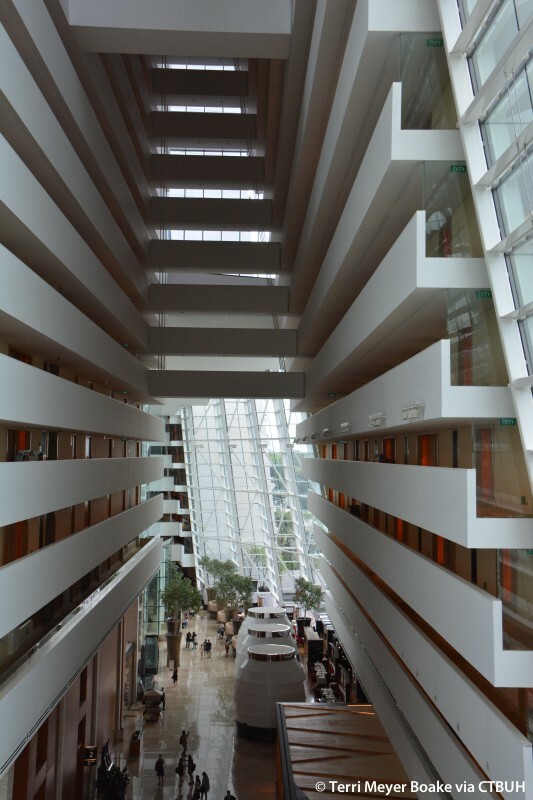 At the ground level, the space between each tower is enclosed to create a hotel lobby and atrium, at the upper levels the space is conceived as an “urban window” that allows for views through the project. 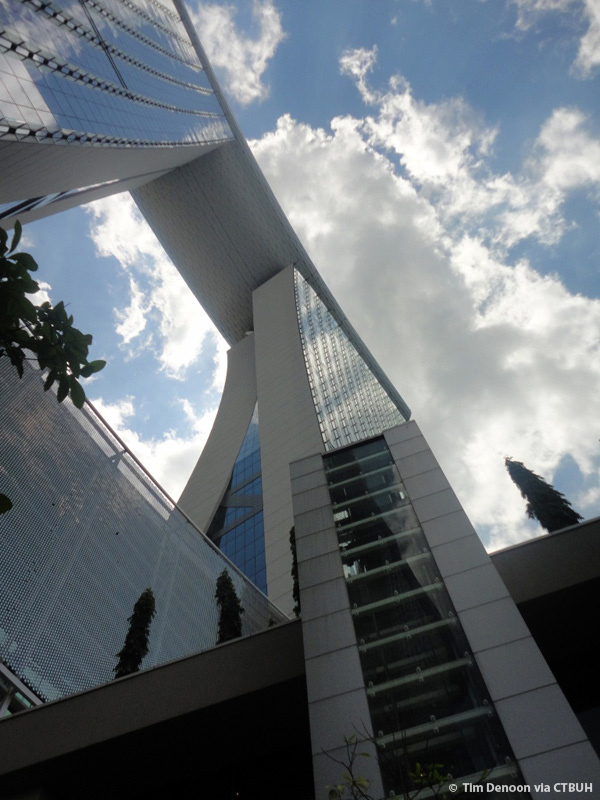 Major steel trusses form a connection between the separate segments of the building’s legs to provide a frame to transfer sheer between the towers and tie the buildings together to resist lateral forces.